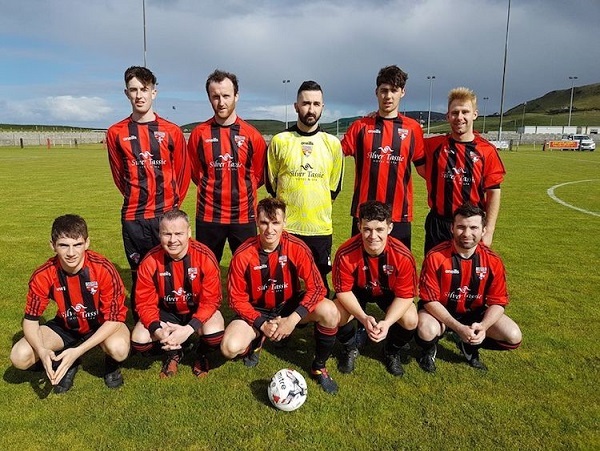 It was the first day of action in the new Ulster Senior League season with two games played, and there were wins for Letterkenny Rovers and Cockhill Celtic. Fanad went into the game without a recognised goalkeeper with their three ‘keepers unavailable, so mid-fielder Conor McNulty stepped into goals for the day. The first half was a poor affair with neither side creating many chances. With 20 minutes gone Paul Bradley struck a shot from outside the box that was well blocked by Ryan McConnell for Letterkenny. Letterkenny took the lead with 10 minutes remaining in the half. When they were awarded a free out on the right, Lee Toland swung a dangerous ball into the box which was met by Conor Tourish who guided a header into the corner. Fanad missed a gilt edged chance to equalise two minutes into the second half. Following some good work by Paul Bradley, his ball into the box was met by Davitt Walsh, when his shot was blocked the ball fell to Dean McCarry who fired over the bar from six yards. Letterkenny introduced BJ Banda from the bench on the hour mark and he made an instant impact scoring two minutes after coming on with a fine finish after being put through down the right. Two minutes later Conor Tourish almost got his second of the game when his header hit the post from a corner. Fanad could have pulled a goal back with 20 minutes remaining but Paddy Carr fired high over the ball from the edge of the area after good pressure from Edward O'Reilly. With ten minutes to go BJ Banda was on target again with an excellent finish high into the net. With the last action of the game Rovers completed the scoring when Shaun McElwaine deflected a shot into his own net. Fanad United: Conor McNulty, Declan McGarvey, Conor Blaney, Shaun McElwaine, Oisin Langan, Dean McCarry, Marty McAteer, Jordan Toland, Paul Bradley, Paddy Carr, Davitt Walsh. Subs used: Peter Curran, Ryan McFadden, Edward O'Reilly. Letterkenny Rovers: Rory Kelly, Chris Flanagan, Lee Toland, Conor Tourish, Ryan McConnell, Chris Malseed, John Bonner, Declan Sharkey, Darren McElwaine, Christy Conaghan, Kevin McGrath. Subs used: BJ Banda, Luke Nelis, Jonathan Cody. Fanad United who played Letterkenny Rovers on Sunday. League champions Cockhill Celtic left Ramelton with all three points following an entertaining game in Swilly Park. Gerry Gill’s free kick on 5 minutes was parried by Swilly goalkeeper Gareth Muldoon and Mark Moran’s follow up effort was also saved. Tony McNamee with an angled shot from 8 yards was narrowly wide on 15 minutes. Cockhill went ahead on 20 minutes when Brendan McLaughlin’s cross was fired home by Martin Doherty. Ryan McDaid of Swilly had a great chance a minute later when the keeper denied him from three yards. A minute later Cockhill broke away and Bart Wesolowski fired home from close range, despite strong protests from the Swilly defenders appealing for an offside. Mark Moran on 62 minutes and Ethan Canning five minutes later with similar type efforts finished the game as a contest. Swilly Rovers: Gareth Muldoon, David Fisher, Shaun Crossan, Frankie McBrearty, Duncan Patterson, James McCahill, Matthew McLaughlin, Aaron Rogan, Tony McNamee, Marty McDaid, Ryan McDaid. Subs: Brandon Wilkie, Ciaran McHugh, Jordan Nugent. Cockhill Celtic: Lee McCarron, Conor McNamee, Lee McColgan, Jason Breslin, Mal McDermott, Denim McLaughlin, Gerry Gill, Marty Doherty, Bart Wesolowski, Brendan McLaughlin, Mark Moran. Subs: Daniel Doherty, Ethan Canning, Aaron Nash, Paul McKinney, Derek Doherty, Gavin Cullen, Jason McCallum.